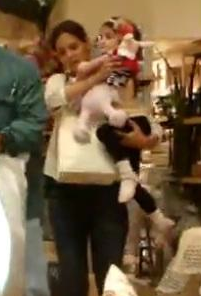 Thank to Amy, we now have the "inside the store" pictures of Suri & Katie shopping at Pottery Barn in Toronto on June 24th 2010. 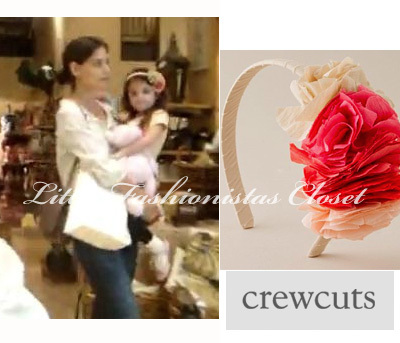 Suri is wearing Pretty Petals Headband by Crewcuts, more outfit info here. note: sorry for the pictures quality. Suri & Katie went shopping in Beverly Hills on Monday, 27. Suri is wearing Floral Print Embroidered Sundress by Old Navy. 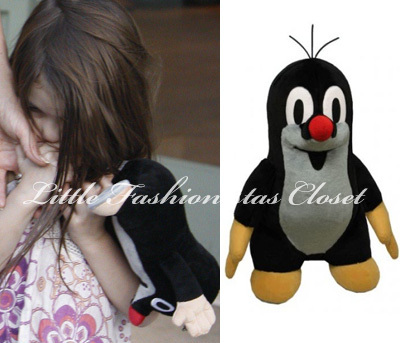 Suri is carrying The Mole plush toy, it is a very popular character among kids in Chezch Republic. The Mole was created by animator Zdeněk Miler for a series of cartoons (50 episodes). Is Suri leaving Prague already? 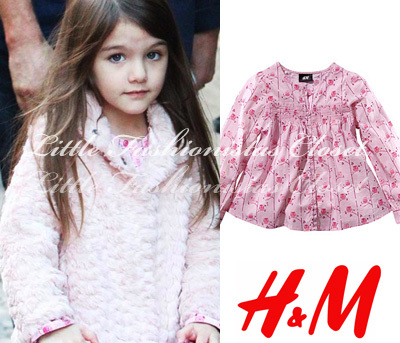 Suri and Katie spent the afternoon playing at the park in Prague on Thursday, 23.
and Black Studded Ballet Flats by H&M. 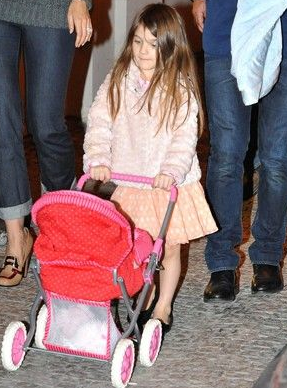 Suri together with TomKat were spotted out for an evening walk in Prague, Czech Republic on Wednesday, 22. Tom is in Prague for filming "Mission: Impossible IV". and Black Quilted Ballet Shoes from American in Paris line by GAP. Suri is pushing Red & Fuchsia Doll Carriage by Corolle . Katie is carrying Shaun The Sheep Cry-Baby Timmy Soft plush toy. Thanks to Katrina for the skirt & carriage id! Thanks to Anonymous for the pictures link! 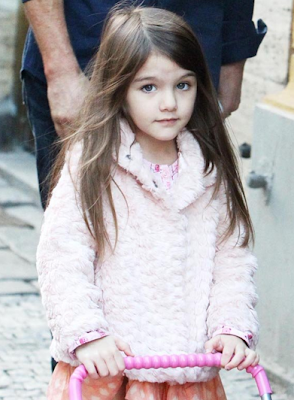 Suri and her parents were spotted leaving their NYC apartment on Thursday, 16. Thanks to Lyna for this picture! 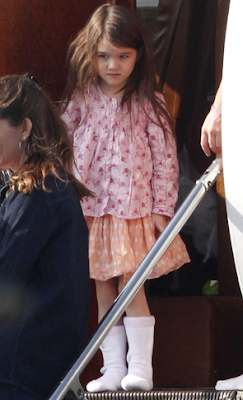 Suri is wearing Striped Tennis Dress by Alice+Olivia Kids. Katie Holmes reportedly dropped $600 on some new outfits for her daughter Suri last week, Page Six notes. A source told the gossip column that Katie stopped by Alice and Olivia by Bryant Park and "picked up a little tennis dress and another lavender ruffled number. She spent around $600." As posted above Suri already wore one of her new dresses - the Striped Tennis Dress ($242) and the other dresses mentioned could be - the Sleeveless Ruffle Dress ($275). Katie bought these 2 dresses and in a size "3" hence the shortness. Even the Manger disagreed but they dared not to challenge Katie Mommy's decisions. ^^wow! no wonder it looks soo short on Suri.. she should probably wear size 5 in the dresses. Katie Holmes insists her adorable daughter Suri is no spoiled brat! In an interview with America’s Marie Claire magazine, the actress — who raises the tot with husband Tom Cruise – says she thinks it’s “important” for her little girl to have duties and responsibilities like any other child. “We travel a lot, and so for me, it’s keeping a daily schedule for Suri that never changes,” Katie said. “We wake up, and we do the same thing. She does her chores. I think it’s very important. “If she doesn’t get her chores done, I notice she’s not nearly herself. “She has to make her bed, she has to take her dishes to the sink, she has to put her clothes in the laundry — you know, that basic stuff. Katie recently admitted she probably won’t have another baby. 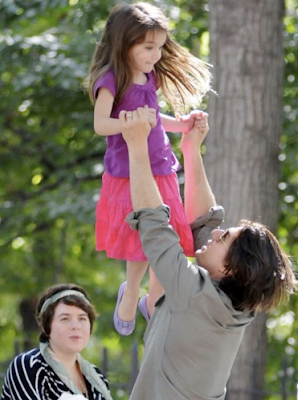 “Maybe in a couple of years, but right now I want to make sure I’m really there for Suri,” she said. Thanks to Kat from Popsugar TV for sending me this hilarious video of Katie talking about Suri's competitive side, during her appearance on Letterman show on Wednesday, 8. Suri's Outfit for < 25$! 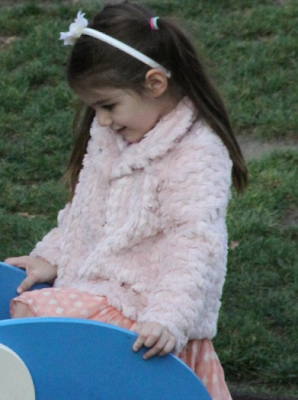 apparently, i misread the news feed - The trio left the NYC apartment, but Katie went to live "Regis & Kelly" show AND at the same time Tom spent afternoon at the park with Suri & his 2 elder children. Suri and TomKat are spotted leaving their Manhattan apartment on Tuesday, 7.
after leaving their apartment, The Cruise Family went to the NYC's Central Park. Suri had lost of fun on the playground! Love her colorful outfit! Suri is wearing the pink skirt (no id) which she first wore on July 21st 2010. 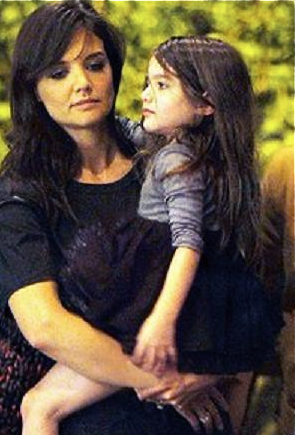 Suri is also wearing Purple Tucked Tee by Crewcuts. 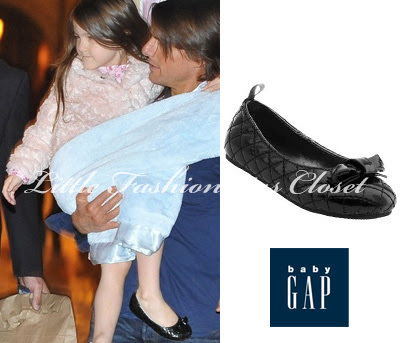 and matching H&M purple ballet flats, which she first wore on August 8th 2010. Thanks to Anonymous and Katrina for the news! Suri with Katie & Isabella flying out of Toronto in a private jet on Monday, 6.
after arriving to NYC, girls met up with boys - Connor & Tom, for dinner at Serendipity 3. 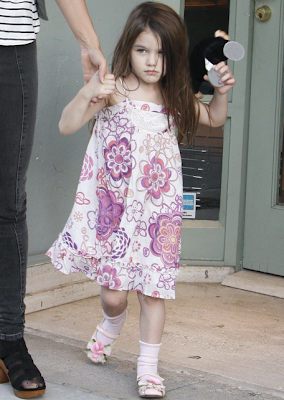 All day long Suri was wearing Crewcuts dress and H&M purple flats.